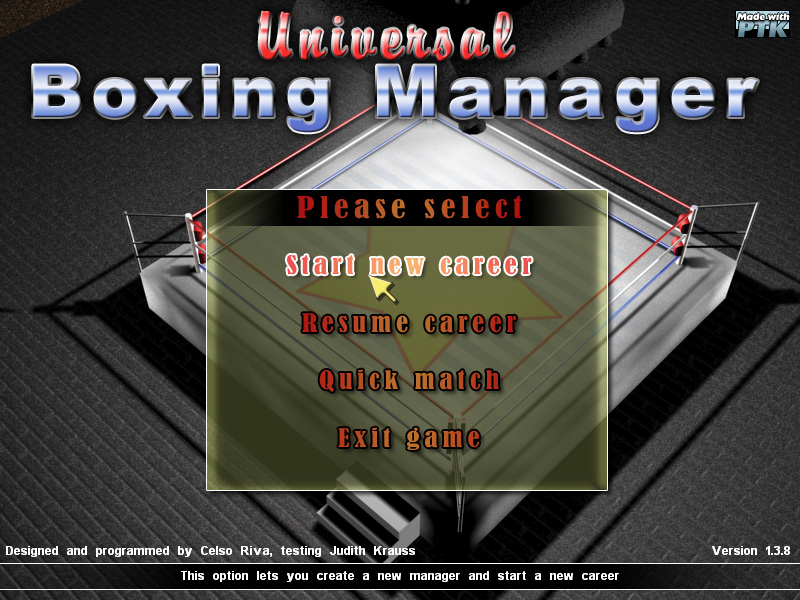 Universal Boxing Manager puts an interesting twist on the professional boxing genre. Instead of being the boxer and trying to make your way up to the championship, you're the boxing manager. So, your goal changes to finding and training as many boxers as possible, putting them in match-ups against other boxers, and having a long and profitable career where you become the highly sought-after manager of choice. While I'm not a big fan of boxing (either the sport or most such games), this game actually sounded like it could be fun. Unfortunately, a somewhat confusing interface and very slow-moving game-play take away from what could have been a game that compelled me to buy the full version. 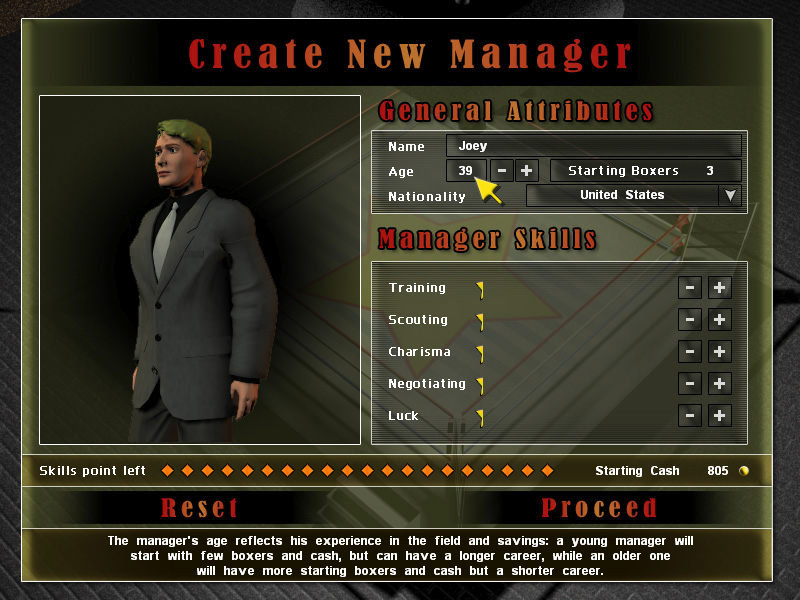 At the start of the game, you can start with a new manager, resume playing with a manager you've already created, or use the "Quick Match" feature to have a new manager auto-created for you with random stats and two boxers ready to rumble. In the demo version of the game that I tried, saving and loading managers is disabled, but creating a new manager and Quick Match are both available. I decided to make my own manager, just to see what the "full experience" is like. When you select "Start Career", you get to define everything about your manager. His name, age (older managers start with more boxers and more money, but have less time before they retire), birth country (boxers from the same country will be more inclined to take a contract with you and generally like you better), and stats. The only thing you can't change is gender -- all managers (and boxers, for that matter) are men. The stats you get to work with are Training, Scouting, Negotiating, Charisma, and Luck. You start off with each skill at level 1, and you get 20 points to distribute among the five stats. Every 3 points in a stat gives you one full star rating in that stat, with a maximum of 7 stars. 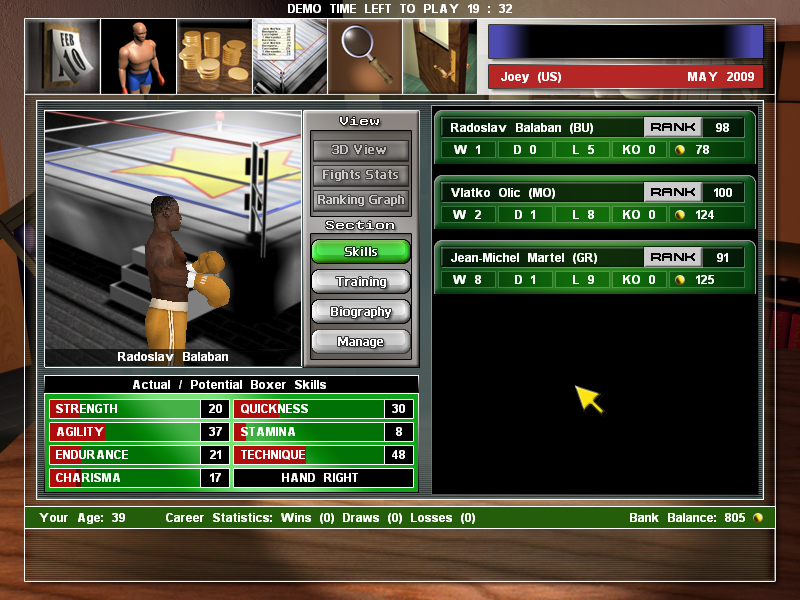 The more points in a skill, the better the results when you apply that skill -- a high Training score means boxers in training will have their skills improve faster; a high Scouting score not only lets you find good new candidates to take under contract, but also lets you more easily identify possible opponents' strengths and weakness (how this works is explained later). Once you've got your manager the way you want him, click "Proceed" and you're taken to the Boxer Stats page, where you get to see the boxers currently under contract. Selecting a boxer lets you view his current and potential statistics, set up his training regimen, view his bio (country of origin, personality, etc. ), and manage him (fire him, renew his contract, or try to boost his morale). This is where the user interface starts to break down. When setting up a training regimen, you get 25 points to distribute among six activities, including running, jump rope, and heavy bag. Each activity affects one of the boxer's skills, such as endurance. The obvious strategy here is to put the most points in the activities that will boost that boxer's weakest skills. Here's where the user interface starts to get in the way of game play: You can't see those skills without switching back over to that view, so you have to jump there, remember which skills are weakest, flip back to the training view, bump up the activities to boost those skills by whatever level you think is best, then go back to skills view and lather / rinse / repeat. You end up spending a fair bit of time with each boxer just to get his training regimen set up right, and you haven't even had any boxing matches yet. Once you've set up the training regimen, your boxers will automatically follow it each month. But you'll notice their scores don't improve much, if at all, after one month or even several. Why? Well, it turns out that your gym has only the most basic equipment for training, and using that low-quality gear means your boxers will only improve very slowly. It turns out you can get better training gear for your boxers, but once again the user interface gets in the way. More on that later. Obviously, a big part of this game is getting your boxers into matches and having them climb the ranking ladder to become champions. So how do you set up and schedule matches? At first glance, you might think the Monthly Schedule screen is the place to go for this, but nope. You actually have to go to the <b>Rankings</b> screen (shown in the image above), which is (to me, at least) totally counterintuitive. On this screen, you click on an individual boxer in the ranking list to see his stats. This is where having a high Scouting skill is handy, since the better your Scouting ability, the more of each boxer's stats that you can see. After selecting a boxer, you can select the month and year for a fight to take place, and then confirm the match. There are two ways to have a match actually take place, and both are accessed from the Monthly Schedule screen. The longer but potentially more fun way is to play out the match in Interactive Mode. Here, you go through an actual 10-round fight, with the boxers moving around the ring, throwing punches, and getting hurt. Between each round, you can tell your boxer how he should fight (mix up his punches, keep going for the head, dance around the ring to exhaust his opponent, etc.) and also decide whether to put your energies into patching up his injuries or giving him a pep talk and boosting his spirits. I had a hard time seeing any difference in effectiveness as I changed up my strategy from round to round, but the single HTML page of instructions that comes with the game download swears that there's a difference, and that the program bases the effects on both your boxer's abilities and those of his opponent. Eventually, you either win the match or you lose. In the screen shots above, my boxer lost by a knock-out. I still got to take a little bit of money home, which was nice, but my boxer had been beaten up badly and wouldn't be competing again for several months. If you don't care about watching the matches and dealing with round-by-round strategy, you can use the Quick Fight option presented on the Monthly Calendar screen. This option lets you cut to the chase and just find out if your boxer won or lost. The game instructions recommend only using this approach when you think you have a sure-fire win, and I'd have to agree. I tried a Quick Fight using one of my other boxers, certain he was fighting someone he'd easily beat, and it wound up being a draw. The other screens in the game let you view your finances, search for new boxers to recruit, and save your progress. Remember how I said there was a way to improve your gym's equipment? Well, it turns out that it's sort of hidden on the Finances screen. This screen lets you make financial decisions as well as view your monthly income and expenses. Among those decisions, you can take marketing offers from vendors willing to sponsor your fighters, choose from doctors with varying experience, and (wait for it...) upgrade your gym equipment. You'd never know it from the on-screen help displayed when you hold your mouse over the Finances icon. All it says is "Analyze your financial situation here by viewing your various sources of income and expenses." If you didn't read the sparse HTML instructions page (where the Finances screen is described in the "Advanced" section), or if you're like me and figured you'd be able to figure out the game on the fly, that's no help at all. Until I went to the screen and started clicking around, I had no idea my gym equipment could (or even needed to) be upgraded. Because I was playing a demo version of the game, recruiting new boxers was disabled, although I could still search for boxers and go through all the motions up to the moment of offering a contract. Recruiting works just about the same as finding a boxer to fight one of your boys. The only main difference is that you're offering a contract, which the boxer can accept or refuse based on things like your reputation as a manager, your charisma, and your negotiating skill. This feature is a critical part of the game, since you want to hire more and better boxers as your rep improves, which will in turn bring in more money from the bouts they fight. As the various screen shots in this review should make clear, the graphics on this game are OK, but nothing to write home about. You have an option for boxers to be displayed in 2D or a rotating 3D view on the non-fighting screens, but the 3D view is just a gimmick, taking a figure rendered in Poser and spinning it around slowly. If this were a shareware game, I'd say the graphics were just average at best. Sound effects are minimal -- clicks as you move from screen to screen or assign points to training, skills, etc. ; and basic sound effects during boxing matches. Neither the graphics nor the visuals will do much to draw you in to the game, and that's a shame given its interesting premise. The deal-breaker for me on this game, more than anything else, was the price the developers are asking for the full version. At $24.95, it's far more than this game is worth. For that price, I would be expecting a far more intuitive and less cluttered UI, not to mention better quality graphics, better sound effects during boxing matches, and game play that didn't feel like I was slogging along. The demo I played gives you 20 minutes to get a feel for the game, and in that time I felt like I hadn't made any progress at all, despite having 3 fights for my boxers and making some efforts to have them train hard the whole time. Maybe I just wasn't following a good strategy, but I should have made some kind of progress that I could see. If the game was priced at $9.95 or so, I'd be able to give it more of a recommendation. But at the price they're asking, they're moving out of the realm of shareware / small development house and into more of the big-leagues of gaming, without showing product quality that holds up to that comparison. I can pay this price or only slightly higher for much better quality games.